These chicken skewers are an ideal starter as they're very quick and easy to cook. We've used a ready-made Gujarati-style spice paste combined with coconut cream, which often features in coastal Indian food. Preheat the grill to high. Soak 24 wooden skewers in cold water until needed. Mix the curry paste and 50ml of the coconut cream together in a bowl. Add the chicken and mix carefully to coat all the fillets in the mixture. Thread each fillet onto a wooden skewer and place the skewers top-to-tail on a rack over a grill pan. Grill for 4-5 minutes. Turn and grill on the other side for a further 4-5 minutes or until thoroughly cooked, the juices run clear and there is no pink meat. 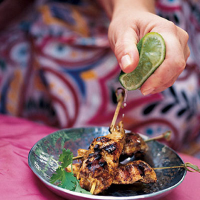 Serve the chicken skewers with the lime wedges and the remaining coconut cream. Marinate the chicken and thread onto skewers before taking them to the party in a cool bag. Grill the skewers when needed. Alternatively, cook in advance and serve cold.